As with most carefully laid plans, something happens that throws you for a loop just when you think it’s smooth sailing. For me, that loop was laziness and boredom. After work on Friday, I just didn’t feel like making another burger (or anything else for that matter). I also didn’t feel like eating a burger. With this sort of dilemma, I just knew the burgers wouldn’t be my best so I decided the end of Burger Week would have to be put off for another time. Maybe this coming Saturday would be a better day. With burgers off the menu and cooking out of the question, I posed the age old question: what should we eat? One of our favorite go-to meals for takeout is tomato pie from Tony A’s here in Philly. Tony A’s is just up the street from us and the tomato pie was ready in 15 minutes. We also ordered a veggie Stromboli to go with our pie simply because neither of us had had a Stromboli before. The Stromboli was just okay for me. The boy seemed to like it a lot more than I did. It was packed with veggies which was great but other than that, it was very underwhelming. There was no sauce, even though I had requested sauce, so the overall taste was just a little bland. The tomato pie, however, can’t be beat. Tomato pie seems to be a local specialty in Philadelphia. I believe it also extends to parts of New Jersey but I can say it’s something I had never heard of before moving here. When I had first heard of it, I’d imagined a pie crust filled with tomatoes. I was thrilled to find out that I was wrong! The basic recipe for tomato pie calls for thick, porous, focaccia-like dough covered with tomato sauce and then sprinkled with grated Romano cheese. Many bakeries and pizzerias have their own variation on this formula. It is not usually served straight from the oven, but allowed to cool and then consumed at room temperature or reheated. 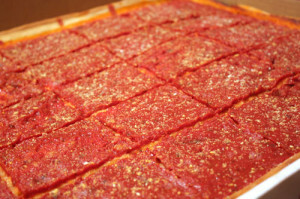 Like Sicilian pizza, tomato pie is baked in a large aluminum pan and served in square slices. Below is a recipe for tomato pie that I did not make but comes highly rated online. I plan to make this soon. Perhaps Saturday and Sunday would be a good time to tackle this so I have time to let the dough rise. To prepare dough, mix warm water and sugar in a large bowl. Sprinkle yeast over it and stir to dissolve. Let stand until mixture bubbles, about 10 minutes. Add oil, salt, and about 75 percent of the flour. Combine with the yeast mixture. Let sit for 20 minutes. Mix in the rest of the flour. Transfer dough to floured surface and knead until smooth, about 10 minutes. Transfer to a large bowl brushed with oil, turning the dough to coat it with oil. Cover bowl with plastic wrap. Let dough rise in warm draft-free area until doubled in volume, about 2 hours. Punch the dough down, and reshape into a ball. Place it back into the bowl, cover it with plastic wrap, and refrigerate 4-12 hours. To prepare sauce, preheat oven to 350 degrees. Coat baking tray with tinfoil and spray with non-stick spray. Slice Roma tomatoes in half. Sprinkle with salt and pepper, drizzle with olive oil and place on baking tray. Roast for 30 minutes. Combine other ingredients in a saucepan and let simmer until thickened. Add in roasted tomatoes when done and mix until there are no large chunks. Simmer for 30 minutes. Preheat oven to 450 degrees. Roll out the dough. Sprinkle a rimmed baking sheet with cornmeal, and lay dough on top. Spread tomato sauce on top in a thick layer. Bake for 30-35 minutes until crust is golden and center is cooked through. Sprinkle with Romano cheese. ~ by canadianbaconette on May 9, 2009.